Montreal! Kid Power Book launch! NEW HORIZZZONS! "KID POWER Book Launch, Screening and Cereal Buffet! 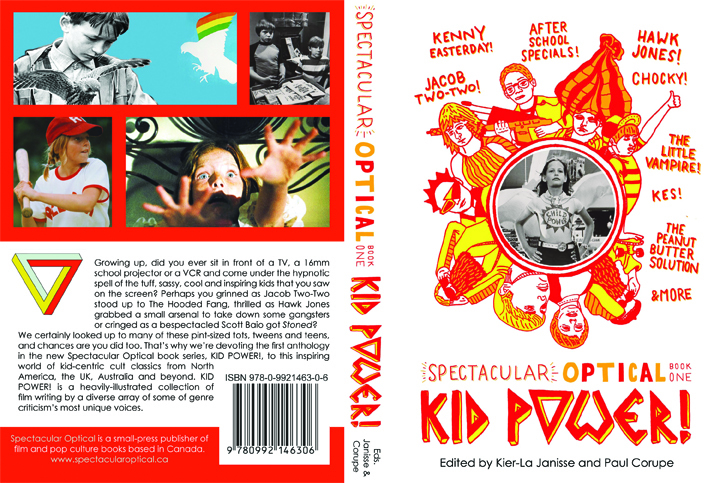 Fantasia is proud to host the world premiere launch of Spectacular Optical’s first anthology book, Kid Power! – all about cool, tuff and inspiring kids in cult film and television. Co-edited by Kier-La Janisse and Canuxploitation’s Paul Corupe and featuring writing by a diverse array of genre film criticism’s most unique voices, Kid Power! covers the gamut from The Peanut Butter Solution to The ABC Afterschool Special and the dark side of Disney. And tons more! The launch will be accompanied by a rare 35mm screening of Something Wicked This Way Comes (1983) and a FREE cereal buffet! Buying in person will save you both on shipping and on the cover price, as we’ll be selling the books on-site for a special price of $25.00 CAD! We’ll have T-shirts for sale too, and maybe even some KENNY skateboard decks!" Playing with Tang Soleil and Babysitter at l'Escogriffe Bar Spectacle. Sat, July 25, 10 pm!